The eighth and final season of Game of Thrones premieres on Sunday, April 14th, and HBO has been in full marketing swing to remind viewers of the years-long journey to get here: Iron Thrones have been hidden around the world, and the network has been producing endless trailers and teasers and spinoff products from custom sneakers to branded Oreos, all centered on one message: #ForTheThrone. But eight years in, Game of Thrones’ title has never been less accurate. As the sweeping stakes of the show have escalated, the Iron Throne of Westeros, and the question of who gets to sit on it, has become almost completely unimportant to the story. When Game of Thrones premiered on HBO on April 17th, 2011, the network didn’t use the poetic but unwieldy name George R.R. Martin gave his densely written book series. The creators simplified: instead of A Song of Ice and Fire, they used a slightly truncated version of the first book’s title A Game of Thrones. Back in season 1, “game of thrones” was an apt description of the action. The show’s driving force was largely political in nature, with far less of a focus on epic fantasy. Instead of giant battles and dragon-filled set pieces, earlier episodes tended to spend more time on debate-filled council sessions and surreptitious alliance-forming meetings than on epic battles. But the stakes have escalated dramatically. 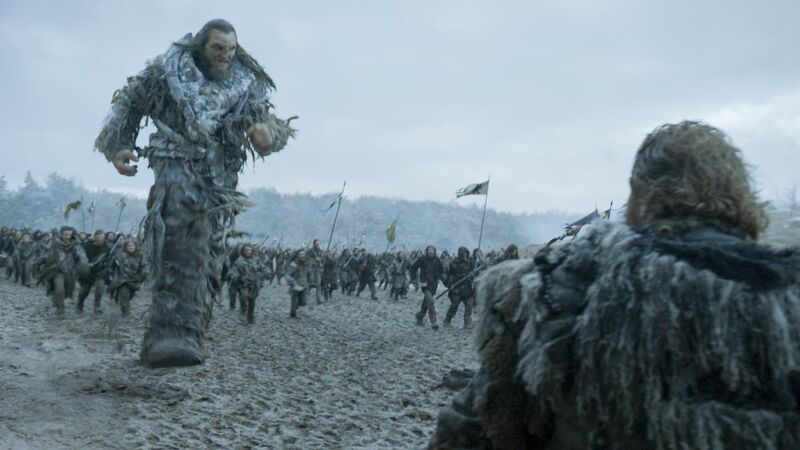 The second and third seasons continued the “game of thrones” theme, with warring factions vying for the throne after the suspicious death of King Robert Baratheon. That was the most apt era of the show for the title, back when there were five kings running around, facing off in actual martial and political contests over the throne. But by the time season 4 ended, the contest for the Iron Throne was virtually over — Robert Baratheon’s supposed heir Tommen (and by extension, his mother Cersei Lannister) had gained near-total control over the country of Westeros. Their power was contested in disastrous ways, but Cersei only solidified her status over the next few seasons. Despite the shifts in power in the south, Game of Thrones has increasingly drawn its focus away from the actual Iron Throne and toward the inevitable fight with the undead White Walkers in the north. Having moved past Martin’s published material and into original scripts, the series has become far flashier, a much more special effects-driven story, more attached to traditional sword-and-sorcery fantasy than Martin’s slow-burning, complicated political gambits, with their scheming and backstabbing. There have been costs to those jumps. Earlier seasons of the show were more grounded in historical politics and realistic in a sort of alternate-medieval-history sort of way, but each progressive year has seen the show get less subtle and more bombastic. In season 1, for example, the show devoted an entire episode (“The Kingsroad”) to showing the time it took to get from the northern castle of Winterfell to the southern city of King’s Landing. Building an army and crossing the Narrow Sea to invade Westeros took up years of plotlines for upstart queen Daenerys Targaryen. But now, characters teleport across the Seven Kingdoms as if by magic, pinging back and forth between the farthest reaches of the North to King’s Landing and back in no time at all as the rapidly accelerating plot demands. That’s partially simple narrative progression. Eventually, events had to come to a head in Westeros. That series title that HBO discarded has been promising a war between fire-breathing dragons and ice zombies since the first book was published back in 1996. But the dried-up well of source material has also contributed. As fans of the novels are exceedingly aware, Martin has only written five of the seven promised books that the show is based on. It’s been nearly eight years since he set out to write the sixth book, The Winds of Winter, and the TV series has moved far past his published stories. Without hundreds of pages of Martin’s political intrigue to guide them, it’s no wonder showrunners David Benioff and D.B. Weiss have shifted toward broad strokes and big battles. The stakes of Game of Thrones have elevated so much that the question of who rules Westeros pales in comparison to the question of whether Westeros can possibly survive. But not everyone has embraced the shift in priorities. Last season ended with Cersei still seeing the White Walkers as a possible weapon in her pointless jockeying to keep the Iron Throne. She’s still playing the game, even if no one else is. Not that this matters to the title of the show. Game of Thrones has become a recognizable, highly successful brand, and so has the Iron Throne. They’re far too well known for HBO to want to change them, or even de-emphasize them in marketing. At this point, the title Game of Thrones is certainly more recognizable than Martin’s original A Song of Ice and Fire — even if that latter title better reflects what the series has become and what we can most expect from the final season.